Over the last few years, Thielsch Engineering has been involved in the inspection, evaluation, and repair of multiple through-wall failures in Bypass Desuperheaters used in combined cycle power plants. The Desuperheater components are designed to operate for short periods of time during start-up to reduce the temperature of steam entering the condenser or to maintain low-temperature steam flow through the HRSG until adequate steam flow and temperature are achieved for steam turbine operation. These components operate in a manner similar to that of standard Desuperheaters used in conventional power plants for the past 40 years. High-pressure feedwater is extracted from the feedwater discharge line and directed to a valve control station, which regulates feedwater sprayed directly into the path of the high-temperature steam. This process reduces the temperature and pressure of the primary steam systems so that it can be recaptured without doing harm to the downstream components. In most combined-cycle designs, however, the in-line piping associated with the Desuperheaters does not include an internal liner commonly found in conventional power plants. This results in spray water coming in direct contact with the pressure boundary piping. It is the direct contact that has produced very high thermal and mechanical stresses that have resulted in through-wall failures and has resulted in numerous failures over a very short period of time. In particular, the design that has shown the greatest propensity for failure involves a heavy-walled desuperheater fitting with multiple spray nozzles around the circumference. To read the full article click here. 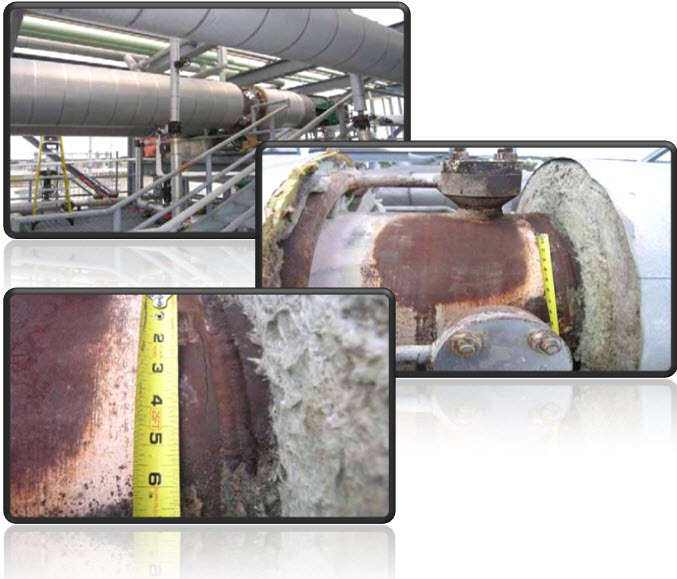 Need help managing the integrity of your High Energy Piping Systems? Click the link below to learn more about Thielsch’s signature 4-SYTE Inspection and Data Management program. For more information about this program and the complete 4-SYTE Strategy System, contact Pamela Hamblin at (561) 353-5804 or by email phamblin@thielsch.com. Posted in High Energy Piping, Uncategorized. Bookmark the permalink.